Make it count, early and often. drewwade on Who pays for the roads? jman on Who pays for the roads? Austin Cycle News… on Who pays for the roads? This post was written by Drew Wade. Early voting is open, so don’t be stuck waiting in lines on November 4. Make sure you get out there and make your voice heard. Also, be sure to vote NO on Amendment 3 — say no to developer based taxing and no to further opening the gates to sprawl. We’ll see if this materializes, but the Senator from Illinois has been doing a lot of talking about bicycles. 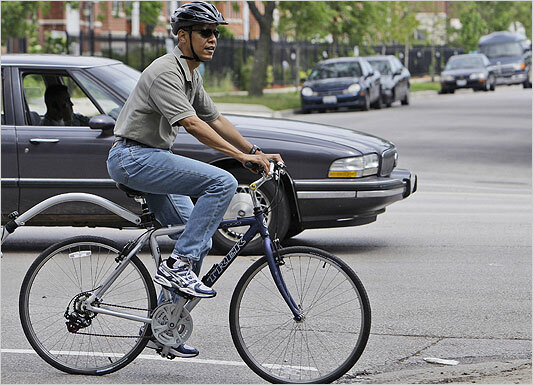 A far cry from what some in the other party have said in the last year, Obama seems to get it about bikes. In fact, he has already met with the board of Bikes Belong, the major industry group for bicycle promotion, promising increased funding for bike and pedestrian projects if elected. What’s more impressive, in the recent picture of him riding a bike with kids in tow, he wears a helmet despite knowing that it makes him look like Urkel. These recent developments remind me of this May cartoon when the other candidates were talking about a gas tax holiday, which as I mentioned here before, every economist and most of America saw through as a foolish waste of money which would actually be counterproductive. Not only that, but he has suggested making rail transportation a priority, suggesting a National Infrastructure Reinvestment Bank and thus sounding like someone who understands that fixing our transportation issues is going to take a lot more than asphalt. Time will tell if America cares, and if so, if he can follow through. Well, it was inevitable. The campaign that would never end stretches on and politicians are eager to offer soundbite solutions. The topic du jour, of course, is the soaring price of oil and gas. McCain and Clinton, of course, have it exactly wrong as also pointed out much more eloquently in this NY Times editorial. Our country is facing economically trying times, partly brought on by outrageous loan practices (followed by a corporate welfare style government bailout, likely with more to come) and partly by decades of woefully inept mismanagement of land use, transportation, and automobile production policies. The solution should be long term — dropping the federal gas tax only increases the demand and puts money in Exxon’s pocket. Better funding for transit, improved MPG standards, and making roads safe for bicycles and pedestrians would make a real long term dent in the problem. Stopping the gas tax for the summer would increase the deficit, provide indirect corporate welfare, and give minimal if any real benefit to the consumer. It’s all too telling of our current policies. When faced with adversity, we say, make it easier! Traffic got you down? Widen the road! Economy tanking? Lower interest rates! Getting fat? Loosen your belt! Trying to fix the economy and our current oil dependence in this way would be like handing out cocaine to fix the healthcare system. Henry Aaron from Brookings, managed to very quickly whip up a list of 150 economists opposed to the gas tax holiday. And there are some pretty impressive folks on the list, from across the political spectrum. So, the penny transportation local option sales tax (TLOST) has passed the State Senate overwhelmingly, still moving through the House. What I like about it is the optional part. It certainly does not presume the needs of a particular region, and funds generated there (disproportionately from tourists here in the coast) go to transportation projects we decide on. I am pleased to see that the group which has been the primary impetus behind TLOST, Get Georgia Moving, has alternative modes (transit and the Beltline in Atlanta) as a part of its recommendations. Now we need to demand inclusion of a provision on Complete Streets. Clint Murphy, a Savannah REALTOR and long time supporter of the Republican Party was recently elected as the Georgia Young Republican National Committeeman in a special election. Murphy has been involved for a number of years in the Republican Party in Georgia, as well as in Washington, DC and in Iowa. Murphy got his first taste of politics in 1990 as a young volunteer for Johnny Isakson in his campaign for Governor. Murphy credits that as being the spark that started his interest in getting involved with Republican politics. Murphy’s first job out of college was on the staff of the late US Senator Paul D. Coverdell. He went on to work as a fundraiser at the National Republican Congressional Committee, serve in the Bush Administration, run a Congressional Campaign, and work in Iowa during the 2002 elections. In 2003, Murphy returned to Savannah to begin his career in real estate. When Johnny Isakson announced for the Senate seat, Murphy signed up to co-chair his campaign in Savannah. Murphy was an early supporter of Casey Cagle in his campaign to become the first Republican elected to the office of Lt. Governor and helped lead the campaign on the coast. Presently, Clint Murphy is on the Georgia Advisory Committee for John McCain for President and serves as Vice Chairman of the Savannah Young Republicans. Murphy serves as Chairman of the Chatham County Urban Transportation Citizens Advisory Committee and in 2007 ran unsuccessfully for the Savannah City Council. In his spare time, Clint likes to bike and is involved with the American Cancer Society’s Relay For Life and the American Diabetes Association’s Kiss a Pig competition. and it seems to be more of the same from what we saw last session. The two chambers have already started their parliamentary smack downs against each other. For those of us who love this stuff it really is interesting watching these two chambers flex their constitutional muscles but for the people of Georgia it is sad. While some of Georgia’s leaders bicker, the people’s work is not being done. I think that issues such as our water plan, transportation, and the Glen tax will be heading to the floor for towards to end of the session. While Clint is the transportation guru, I will leave that to him (just give me a hi-speed train from SAV to ATL). The Glenn Tax, I am sure all have a chance to weigh in on this one. However, the water plan is special and I will be preparing a post about that later. Enjoy your day and thank a veteran ( BTW the Wild Hog Supper this year was fun). I’m hearing that the gun bill may come up as early as WEDNESDAY in the State Senate. It is imperative that we email our State Senators and let them know how we feel about this issue. Also, contact the Lt. Governor, Casey Cagle, and let him know how you feel about this issue.